1. Rub the steak with the oil and some seasoning. Heat a frying pan, then sear the steak for 2 minutes on each side until dark brown on the outside for rare, or 3 minutes on each side for medium. 2. Tip the beetroot into the hot pan, tumble them around a few times, then add the balsamic vinegar. Take the pan off the heat and let the steak rest for a few minutes before slicing thickly against the grain. Keep any juices from resting and carving. 3. Stir the horseradish and ricotta together and swirl over two plates. 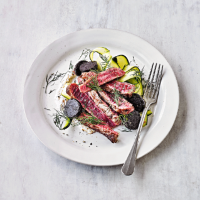 Top with the courgette ribbons, then mound the steak and beets on top. Drizzle with the pan and meat juices, then scatter with the dill. Cook’s tip This would also make a great alternative to roast beef at the weekend. Try it with Waitrose Seasoned Charlotte Potatoes and a watercress salad. 1 of your 5 a day; high in protein.